SYNOPSIS: Through a secret experiment gone awry, Shoeshine acquires incredible superpowers, including the ability to fly and speak. After escaping from the megalomaniacal doctor and his henchman Cad (Warburton), Shoeshine is adopted by an ex-cop (Belushi). Armed with a fetching superhero costume, Underdog vows to protect the beleaguered citizens of Capitol City and, in particular, one beautiful spaniel name Polly Purebred. When a diabolical plot by Barsinister and Cad threatens to destroy the city, only Underdog can save the day! 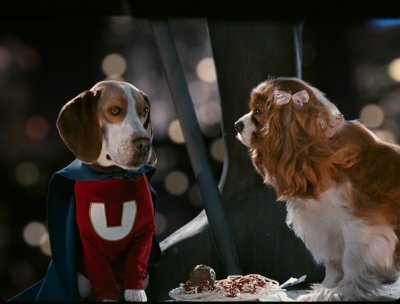 REVIEW: Based on one of the most famous cartoon characters from the 60's, director Frederik Du Chau brings to life his 21 st century version of "Underdog". Film that was released in theaters back on August 3 2007 and managed to collect around 42 million in the box office. The film was produced by Spyglass Entertainment and Classic Media and distributed theatrically by Disney Pictures. This film can be viewed from two different angles for fans and non fans. For fans, the film offers the chance to enjoy an updated version of the K-9 superhero. However some of those fans will complaint about the true origins of "Underdog" and probably will agree that the sound of voice of their superhero is not the nerdy voice of the original. Instead "Underdog" has teenager cool voice, that adds more fun to the character. In addition, there is the new generation of moviegoers or new fans that will enjoy the film as an average DVD movie, and nothing more. The bottom line is that the film is well done and the story is easy to follow specially for the little ones, who will be greatly entertained. The selection of Jason Lee for the voice of underdog was an excellent choice by the producers. Jason added the appropriate tone of voice that Underdog needed in this day and age. The film doesn’t earn too much for special effects, since there is nothing that we haven’t seen before in the “Wonderful World of Disney ” TV movies. Underdog Original Cartoon Episode —“Safe Waif,” the very first cartoon episode featuring the caped canine.